Hornady Match ammo is specifically designed and built to be one of the most accurate rounds you will ever shoot through any of your rifles. 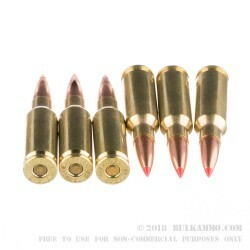 The 6.5 Grendel round was designed to be used in the 200 yard to 800 yard range, with an extremely fast velocity and a manageably low recoil impulse. Hornady paired their proven match grade round production process with their well known and highly accurate, boat tail, low drag red polymer point A-Max bullet for a combination that is just what you need for your next day at the range or for your next hunting trip. 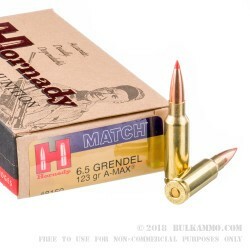 The Hornady Match 6.5 Grendel Match A-Max 123 grain cartridges scream at a muzzle velocity of 2620 feet per second, and have a heavy duty muzzle energy of 1875 foot pounds. 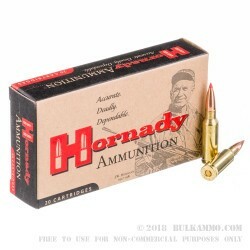 These Hornady 123 grain A-Max Match 6.5 Grendel rounds use reloadable, boxer primed, non-corrosive, highly polished brass cases that are examined and selected by hand for consistent weight, accuracy, wall thickness, case capacity, and primer pocket concentricity, and more. These Hornady 6.5 Grendel cartridges come ready to load up and shoot in 20 round boxes in the well known Hornady Match grade round packaging. 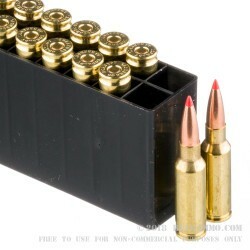 Get a small box of 20 rounds to try out this Hornady cartridge today.